An important physiological function of the normal prostate gland is the synthesis and secretion of a citrate rich prostatic fluid. In prostate cancer, citrate production levels are reduced as a result of altered cellular metabolism and bioenergetics. Na, K-ATPase is essential for citrate production since the inward Na+ gradients it generates are utilized for the Na+ dependent uptake of aspartate, a major substrate for citrate synthesis. 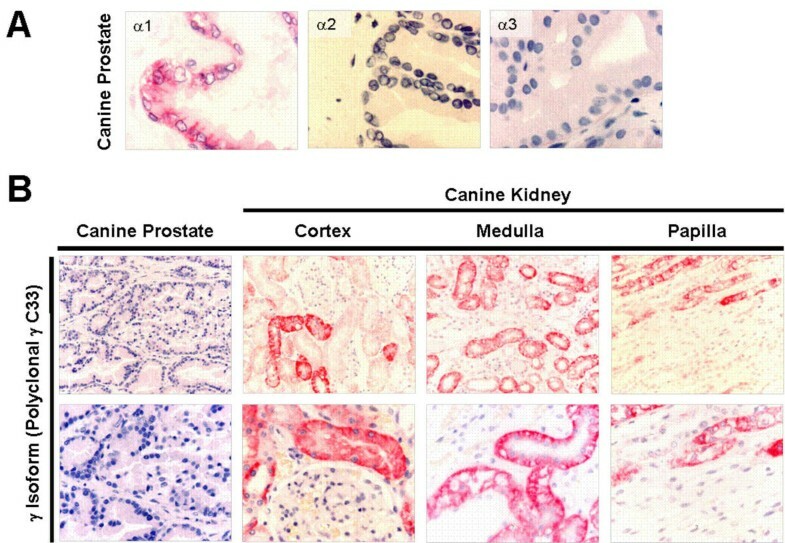 The objective of this study was to compare the expression of previously identified Na, K-ATPase isoforms in normal canine prostate, benign prostatic hyperplasia (BPH) and prostatic adenocarcinoma (PCa) using immunohistochemistry in order to determine whether reduced citrate levels in PCa are also accompanied by changes in Na, K-ATPase expression. Expression of Na, K-ATPase α1 and β1 isoforms was observed in the lateral and basolateral plasma membrane domains of prostatic epithelial cells in normal and BPH prostates. Canine kidney was used as positive control for expression of Na, K-ATPase α1 and γ isoforms. The α1 isoform was detected in abundance in prostatic epithelial cells but there was no evidence of α2, α3 or γ subunit expression. In advanced PCa, Na, K-ATPase α1 isoform expression was significantly lower compared to normal and BPH glands. 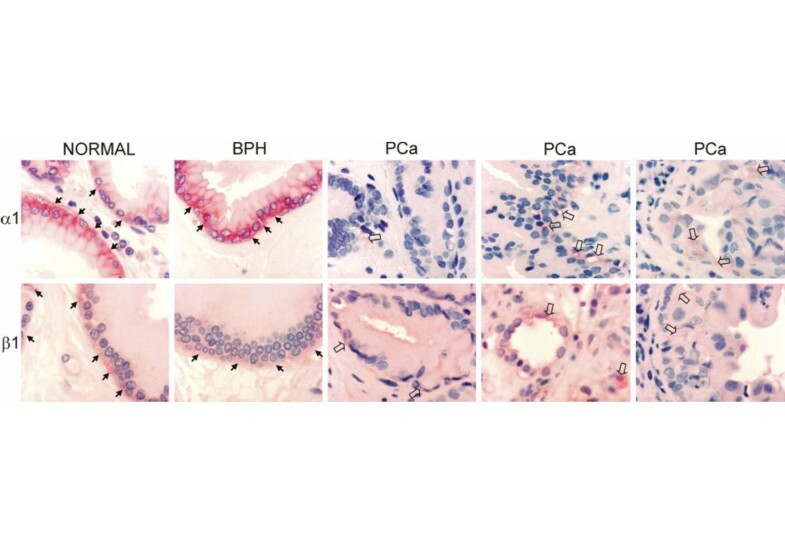 The abundant basolateral immunostaining observed in normal and BPH tissue was significantly attenuated in PCa. The loss of epithelial structure and function and the transformation of normal epithelial cells to malignant cells in the canine prostate have important implications for cellular metabolism and are accompanied by a down regulation of Na, K-ATPase. The principal physiological function of the prostate gland is the synthesis, accumulation and secretion of the anion citrate . Citrate may be used as an important energy source for spermatozoa, or involved as a buffer or chelator of cations in seminal fluid . Na+ dependent uptake of aspartate from plasma is achieved by two kinetically distinct Na+-dependent transport systems to create a high cytosolic aspartate concentration . Aspartate provides the intra-mitochondrial source of oxaloacetate while glucose provides the source of acetyl-CoA for citrate biosynthesis . Ouabain-sensitive Na, K-ATPase-mediated transport is critical for aspartate uptake, citrate production and prostatic fluid formation since the inward Na+ gradients generated by Na, K-ATPase are utilized for the Na+ dependent uptake of aspartate. Na+ and K+ also represent a large component of prostatic fluid osmolarity  and their levels are finely regulated by plasma membrane transport systems that have yet to be identified. Furthermore, androgen activation of Na, K-ATPase serves as a metabolic pacemaker in the prostate [6, 7] exerting transcriptional control over the expression of Na, K-ATPase subunits, which play a critical role in the biogenesis of Na, K-ATPase in prostate cancer [8, 9]. In normal prostate, citrate concentrations in prostatic fluid range from 40 to 150 mM. In prostate cancer however, citrate production levels are significantly reduced as a result of altered cellular metabolism and bioenergetics . Na, K-ATPase is an important regulator of intracellular electrolyte levels in almost all mammalian cells [10, 11]. It is a Mg2+-dependent P-type transport pump responsible for maintaining the low intracellular Na+:K+ ratio that is essential for cell homeostasis and physiological function. It catalyzes the active uptake of K+ and extrusion of Na+ at the expense of hydrolyzing ATP with a stoichiometry of 3Na+ for 2K+. The active form of Na, K-ATPase is an integral membrane protein complex primarily composed of two non-covalently attached subunits; a 110-kDa catalytic α subunit and a 45–55-kDa glycosylated β subunit. The α subunit has binding sites for Na+, K+, ATP and cardiac glycosides (digitalis and ouabain) . Four α isoforms encoded by different genes have been identified which are ~85% identical at the protein level [13, 14]. The β subunit is a complex type II glycoprotein with a short cytoplasmic NH2 terminus, a single transmembrane domain and a large globular COOH ectodomain containing three disulfide bridges and sites for N-linked glycosylation. Renal Na, K-ATPase consists of an additional small component known as the γ subunit [15, 16]. The γ subunit is a member of the FXYD family of small ion transport regulators  and is believed to be responsible for fine regulation of Na+ transport in the nephron by modulating the transport function of renal Na, K-ATPase [18, 19]. We have previously shown that human and rat prostatic epithelial cells express the α1, β1 and β2 isoforms of Na, K-ATPase [20, 11]. Despite the importance of Na, K-ATPase function for citrate production there is no information about its expression patterns in hyperplastic or neoplastic prostate. The objective of this study was to determine the localization of Na, K-ATPase and to compare expression of Na, K-ATPase isoforms in normal canine prostate, benign prostatic hyperplasia (BPH) and prostatic adenocarcinoma (PCa) in order to determine whether reduced citrate levels in PCa are also accompanied by changes in Na, K-ATPase expression. In normal prostatic tissue (Fig. 1, panel A) glands are lined with a relatively continuous sheet of simple cuboidal to low columnar/pseudostratified epithelial cells which are separated by stromal connective tissue consisting of smooth muscle, blood vessels and neuroendocrine cells. Normal glands exhibit large lumens without evidence of tufting or micropapillae. The tissue in panel B exhibits all the classic morphological features of BPH; the tubuloalveoli vary in size and form with many of the individual glands appearing cystically dilated or collapsed. Epithelia consist of columnar cells but some basal cells are also present. Panel C shows sheets of neoplastic epithelial cells that are morphologically typical of high-grade adenocarcinoma. Epithelial and stromal cells are densely packed and disorganized. There is marked cellular and nuclear pleomorphism and numerous mitotic figures are observed particularly in the epithelial cells layer. Enlarged hyperchromatic nuclei display marked anisokaryosis. Nucleoli are large and prominently multiplied. The basal cell layer is often irregular in contour but basement membranes appear confluent. Micro-glands exhibit ill-defined lumens significantly constricted by the geometric progression of proliferating cells. Histological appearance of normal (A), BPH (B) and PCa canine prostate tissues incorporated in this study. In the normal prostate continuous sheets of epithelial cells (ec) are separated by connective tissue stroma (S) consisting of blood capillaries (indicated by closed arrows), smooth muscle and neuroendocrine cells. BPH glands display smaller lumens (L) compared to normal tissue with evidence of tufting and micropapillae. PCa glands are lined with neoplastic cells exhibiting cellular and nuclear pleomorphisms and numerous mitotic figures (open arrows). The basal cells (bc) were irregular in contour but the basement membrane appears confluent. Original magnifications: × 400. 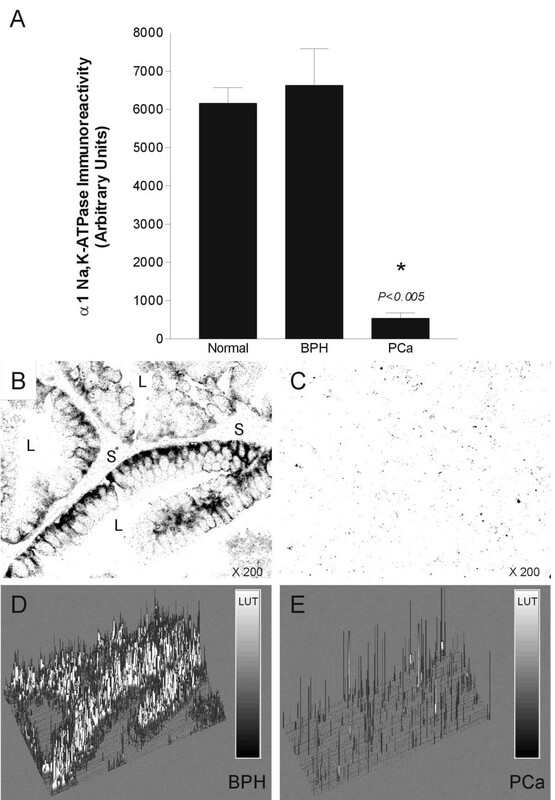 Expression of Na, K-ATPase α1 and β1 isoforms was observed in the lateral and basolateral plasma membrane domains of prostatic epithelial cells in normal and BPH prostates (Fig. 2). In advanced PCa, Na, K-ATPase expression was significantly lower compared to normal and BPH glands (Fig. 2). The expression observed in high grade (poorly differentiated) adenocarcinomas was significantly lower than low grade (well differentiated tumours); the abundant basolateral immunostaining observed in normal and BPH tissue was significantly reduced in high grade PCa as determined by immunohistochemistry using a monoclonal pan α antibody (mAb9A7) that has been shown to recognize the α1 isoform in addition to all other known α isoforms  (Fig. 3). Identical results were obtained using the α5 monoclonal pan α antibody (results not shown). Image analysis confirmed the down-regulation of Na, K-ATPase (Fig. 5). Immunohistochemical staining of Na, K-ATPase α1 and β1 subunits in canine normal, BPH and PCa tissues. Sites of Na, K-ATPase immunoreactivity are stained red (using Fast-Red TR/Naphthol AS-MX as precipitating substrate for the alkaline phosphatase conjugated secondary antibody). In normal and BPH sections Na, K-ATPase immunostaining is clearly visible in the basolateral membrane domain of epithelial cells (arrows). In three different PCa specimens Na, K-ATPase expression levels appear to be significantly lower than in normal or BPH tissues and Na, K-ATPase is diffusely spread within focal areas of the neoplasm. Nuclei were counterstained with haematoxylin. Comparing the immunohistochemical localization of Na, K-ATPase "α" subunits in normal, BPH and PCa tissues using a pan α monoclonal antibody (mAb9A7) that recognizes all known α isoforms. The pan α monoclonal antibody produces a staining pattern which is identical to the α1 specific antibodies providing further evidence for the predominance of α1 expression in the prostate and the downregulation of Na, K-ATPase in PCa. 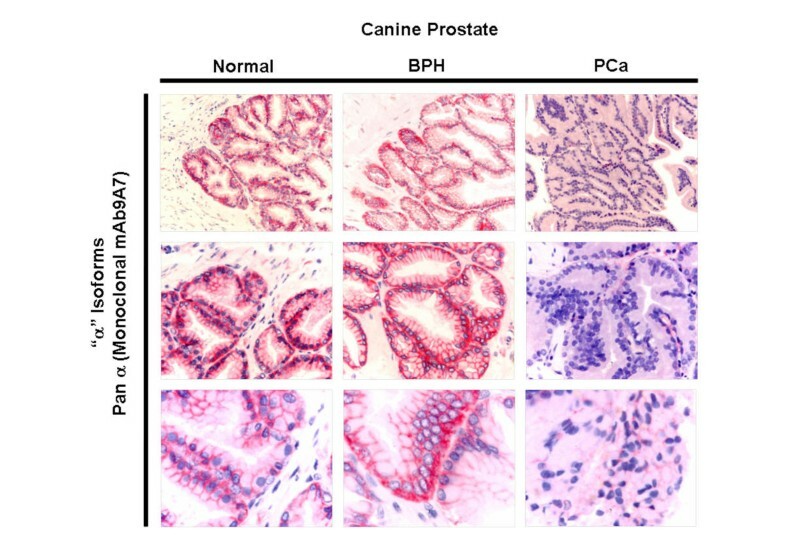 Quantitative analysis of Na, K-ATPase immunoreactivity in normal, BPH and PCa canine prostate. Panel A; results of image analysis experiments performed in triplicate comparing Na, K-ATPase expression levels in tissue sections immunoassayed with a polyclonal antibody to the α1 subunit of Na, K-ATPase under identical experimental conditions. Panels B and C; representative sections used for analysis. Panels D and E; plot profiles of Na, K-ATPase abundance in the BPH and PCa sections. The α1 isoform was detected in abundance but there was no evidence of α2 or α3 isoform expression (Fig. 4A). The γ isoform was not detected in canine prostate (Fig. 4B). Canine kidney was used as a positive control to confirm that the polyclonal antibodies raised against the rodent γ isoform recognize the canine γ isoform expressed in the nephron (Fig. 4B). Although the γ isoform was not detected in all nephron segments, it was found in low levels in basolateral membranes of proximal convoluted tubules and in very high levels in the medullary thick ascending limbs, distal convoluted tubules and connecting tubules. The γ isoform was not present in the medullary and papillary collecting ducts. Panel A: Absence of Na, K-ATPase α2, α3 and γ isoform expression and comparison with α1 expression in canine prostate. Original magnifications: × 800. Panel B: Evidence to confirm that the γ C33 polyclonal raised against the rodent γ isoform recognizes the canine γ isoform protein in the canine kidney. The expression of the γ isoform is not detected in all nephron segments (i.e. medullary and papillary collecting ducts) but it is present in low levels in proximal convoluted tubules and in high levels in the medullary thick ascending limbs, and the distal nephron. 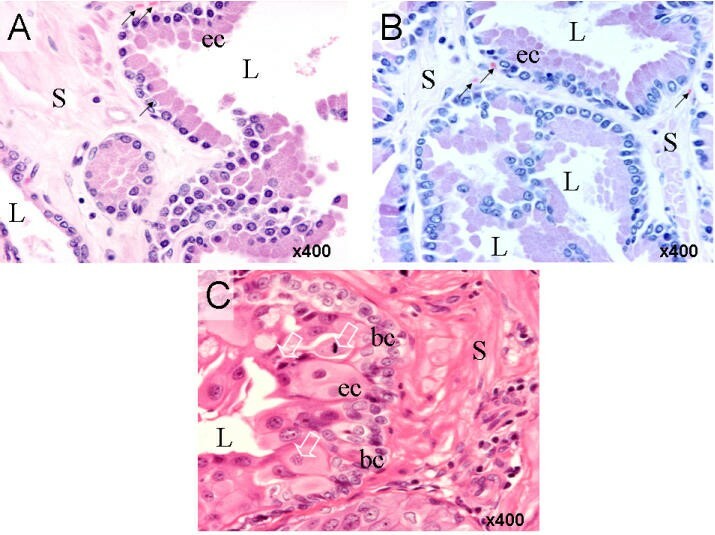 The results of this study reveal that the α1 and β1 subunits are the dominant Na, K-ATPase isoforms expressed in the basolateral membranes of epithelial cells in normal and BPH canine prostate. The α2, α3 and γ subunits of Na, K-ATPase are not expressed in this tissue. Immunohistochemical and image analyses performed in this study suggest that Na, K-ATPase expression is significantly reduced in canine PCa. The cause of this down-regulation is not known at present but it may be associated with the loss of epithelial polarity and function in prostate cancer. It may also be related to the reduced citrate production and secretion that accompanies neoplastic development in the prostate . There is, however, an argument against the latter scenario: unlike the human prostate, the canine counterpart does not produce huge quantities of citrate (L.C. Costello, personal communication). Therefore, the down-regulation of Na, K-ATPase could be intricately involved in a series of other metabolic changes that occur during the progression of prostate malignancy, or it could merely be a consequence of such changes, which has little effect in the process of neoplastic transformation. Androgen ablation therapy is often used to treat advanced prostate cancer – a treatment that is successful until the malignant growth evolves resistance to this and becomes androgen-independent . Previous studies have indicated that the β-subunit of Na, K-ATPase is down-regulated in the prolonged presence of a synthetic androgen at a transcriptional level, resulting in a reduction of functional Na+, K+-ATPase in androgen-dependant prostate cell-lines . Studies have also shown that voltage activated sodium channel (VASC) activity and expression is altered in prostate cancer cell lines  and VASC protein expression has been shown to enhance the invasive, metastatic properties of rat and human prostate cancer cells . Taken together, these results suggest that neoplastic development in the prostate is accompanied by changes in cell homeostasis and expression levels of ion transporters including Na, K-ATPase and VASC. Whether Na, K-ATPase expression is also reduced in human PCa remains to be determined. The metabolic transformation of zinc-accumulating citrate-producing normal prostate epithelial cells to citrate-oxidizing malignant neoplastic epithelial cells has important implications for cell metabolism and appears to be accompanied by a down regulation of Na, K-ATPase. Given the importance of the altered intermediary metabolism of prostatic cells in the pathogenesis of malignant prostatic adenocarcinoma and the progression of malignancy [4, 25], the focus of future studies will be to address the role of Na, K-ATPase and other ion and metabolite transporters as potential epigenetic factors which may contribute to the metabolic transformation of sane cells to neoplastic cells. Sodium and potassium flux pathways (including Na, K-ATPase, Na/K/2Cl co-transport and voltage-gated Na+ channels) have already been studied in prostate cancer cells lines in terms of their potential value as targets for cytotoxic anti-neoplastic therapy [26–28]. Our results suggest that down-regulation of Na, K-ATPase in prostate cancer may accompany the up-regulation of voltage-gated sodium channels that has been observed by other investigators, contributing to the hyper-excitability of prostate cancer cells. These phenotypic changes will influence citrate biosynthesis, zinc uptake and energy metabolism (Fig. 6) and may promote neoplastic development, galvanotaxis and metastasis . Collectively these observations have important implications for cellular homeostasis, bioenergetics and metabolism and justify further functional (i.e. Na+ and K+ flux measurements) and molecular studies to evaluate the role of ion transport pathways and the regulation of their expression during neoplastic development and metastasis in the prostate. 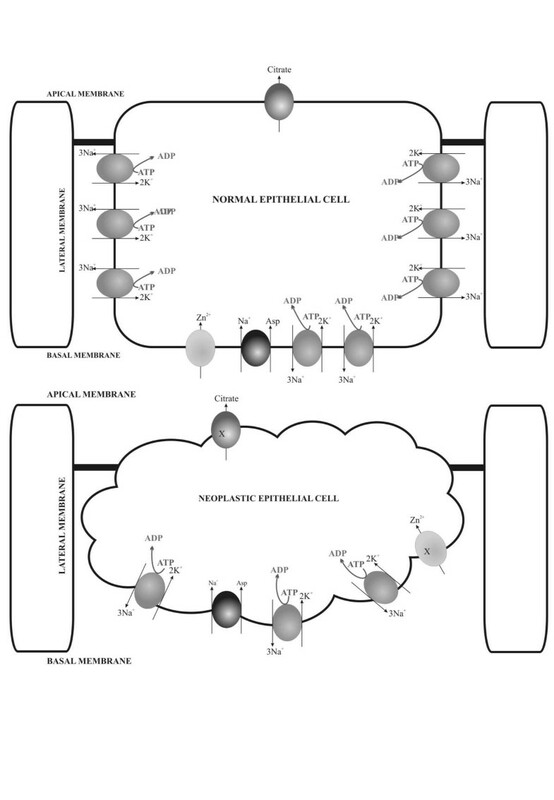 Proposed scheme for the role of Na, K-ATPase in maintaining prostatic epithelial cell polarity and citrate-related energy metabolism (adapted from a concept first proposed by Costello and Franklin, 2000). Normal prostate cells abundantly express basolateral Na, K-ATPase to maintain cell homeostasis and epithelial polarity. These cells contain specific transport mechanism for the accumulation of high levels of zinc and aspartate for optimal citrate biosynthesis. Aspartate, is transported into prostate epithelial cells on a high-affinity Na+-dependent carrier which resides in the basal cell membrane and is dependant on Na, K-ATPase activity . The citrate transporter itself has yet to be identified but has been proposed to be localized in the apical membrane where it contributes to the accumulation of a citrate rich prostatic fluid [2, 1]. The genetic transformation of a normal prostate cell to a neoplastic cell has been proposed to be accompanied by an impaired ability to accumulate high levels of citrate. The neoplastic cell begins a metabolic transformation to a citrate-oxidizing cell, losing the ability to accumulate important factors such as zinc. Thus begins a metabolic conversion to a pre-malignant or malignant citrate-oxidizing cell. The loss of basolateral Na, K-ATPase appears to be one of a number of phenotypic changes that accompany this transformation. This alteration will no doubt influence the membrane potential, homeostatic responses to ionic perturbations mediated by ion channels and secretory functions. Normal (2 prostates), BPH (2 prostates) and PCa (3 prostates) were dissected from the cadaver of canines following euthanasia. Normal and BPH tissue was obtained from animals euthanased for non-related clinical reasons. Canine kidneys were used as positive controls for expression of Na, K-ATPase γ subunit. All the procedures were carried out in accordance with current local guidelines. Tissues were fixed for 48 hrs in neutral buffered formalin before being embedded in paraffin wax. The sections of prostate tissue were histologically and morphologically analyzed using established histpathological criteria (i.e. cellular and nuclear pleomorphisms as evidence of dysplastic and neoplastic alterations ) by two independent veterinary pathologists and were categorized into normal, BPH, well differentiated (low grade) and poorly differentiated (high grade) adenocarcinomas. All chemicals and secondary antibodies used were purchased from Sigma Biosciences (Poole, Dorset, UK). Fast-Red alkaline phosphatase precipitating agent was purchased from Sigma/Aldrich (Poole, Dorset, UK). Immunohistochemical studies were carried out on 8μm paraffin sections mounted on 3-aminopropyl-triethoxysilane (APES) treated slides. Normal, BPH and PCa tissues were incubated for identical periods of time with antibodies and the precipitating agent throughout the studies. Sections were dewaxed in 100% xylene for 5 minutes and taken through a graded series (100%, 70 % and 50%) of alcohol baths for 1 min each before antigen retrieval in the microwave oven in the presence of 10 mM citrate buffer (pH 6.0) for 12 minutes. The sections were allowed to cool before washing in phosphate buffered saline solution (PBS). Endogenous alkaline phosphatase was blocked for one hour at room temperature (RT) by treatment with 1.25 mM Levamisole solution (Vector Laboratories, Peterborough, UK). Non-specific protein binding sites were blocked by addition of 10% normal goat serum in PBS (1 hour RT). A panel of monoclonal and polyclonal antibodies to the α and β subunits of Na, K-ATPase was used (Table 1). Sections were incubated with primary antibodies (various dilutions in PBS) for 24 hrs at 4°C and subsequently washed in PBS before a two-hour incubation with goat anti-rabbit IgG or goat anti-mouse IgG conjugated to alkaline phosphatase. Tissue sections were washed in PBS and alkaline phosphatase active sites were developed using Fast-Red TR/Naphthol AS-MX as precipitating agent for 10–15 minutes. Sections were counterstained with haematoxylin for 1 min and washed in distilled water before mounting in aqueous medium and visualization under a light microscope. Photographs were taken using a Nikon Microphot-FX microscope fitted with a Nikon DXM1200 digital camera or goat anti-mouse IgG. Isoform specific antibodies used to detect the isoforms of Na, K-ATPase in canine prostatic tissue by immunohistochemical analysis. § The α5 monoclonal broadly recognizes Na+, K+-ATPase α subunits of avian, mammalian and insect species. There are 4 known α isoforms and the designation " α5" does not indicate the existence of a fifth Na+, K+-ATPase α isoform. The α5 antibody developed by D. Fambrough was also obtained from the Developmental Studies Hybridoma Bank developed under the auspices of the NICHD and maintained by The University of Iowa, Department of Biological Sciences, Iowa City, IA 52242, U.S.A. The monoclonal antibody XVIF9G10 developed by K.P. Campbell http://www.physiology.uiowa.edu/campbell/public/Antibodies.htm is commercially available from Affinity Bioreagents. Image analysis was carried out using Scion Image for Windows (version 4.0.2 http://www.scioncorp.com/) based on NIH Image for Macintosh. Sections used for image analysis were only exposed to the Fast-Red precipitating agent and not counterstained with hematoxylin. The results are expressed as the means +/-SD of a representative experiment performed in triplicate. The means were compared using student's t-test assuming equal variances. p < 0.05 was considered statistically significant. In a very recent study of Na, K-ATPase α and β subunit expression in bladder tumours, human urothelial cancer tissue microarrays have been successfully used to demonstrate that the mean protein expression for both α and β subunits of Na, K-ATPase is reduced in invasive bladder tumours compared to benign and dysplastic tissue . These recent findings partially confirm our results in canine prostate cancer. The authors have suggested that Na, K-ATPase α and β subunit expression levels may be useful predictors of clinical outcomes. Research grants from the Pet Plan Charitable Trust (Grant no. 02–11) and the Wellcome Trust (U.K.) supported this work. We wish to thank the pathologists of the Department of Veterinary Pathology at the University of Liverpool for supplying tissues and original histopathological interpretations. We are particularly grateful to Dr M. Takahashi and Dr M.W. McEnery for the pan α specific monoclonal mAb 9A7. We express our gratitude to Dr. D.M. Fambrough (Johns Hopkins University), Dr. K.J. Sweadner (Harvard University), Dr. S.J.D. Karlish (Weizmann Institute of Science, Rehovot, Israel) and Dr. M.J. Caplan (Yale University School of Medicine) for their continued generosity in provision of antibodies. We would also like to acknowledge Dr. D. Alvarez de la Rosa (Yale University School of Medicine) for critical comments on the manuscript and Dr. L.C. Costello (University of Maryland) for useful discussions and invaluable advice.